Majors: Can Draghi keep a lid on the EUR? Dollar bloc: Venturing into dangerous territory? 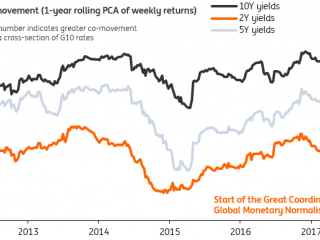 Markets are slowly waking up to the idea that the race to monetary normalisation is a marathon, not a sprint. This week's standout event - the July ECB meeting on Thursday - will put this idea to the test, with President Draghi undoubtedly aware that investors will be hanging on every word he says. It seems a bit too early for officials to make any bold changes to their QE policy, with the ECB President's headline appearance at the annual Jackson Hole symposium in August a more apt opportunity to signal a policy regime shift. But in the absence of any outright dovish comments this week, we suspect the EUR will remain a "buy on the Draghi dip". Normalising monetary policy in the absence of any strong inflationary pressures does create a slightly uncomfortable market backdrop. Certainly, concerns about unfounded currency strength may creep into central bank talk in Australia and New Zealand this week, with both the AUD and NZD venturing into slightly concerning territories. The Bank of Canada's lack of concern over the Canadian dollar has surprised us, but we still think the currency is punching above its weight. Key Canadian data at the end of the week might be a risk to the recent bullish CAD move. EUR/USD heads into the July ECB meeting on Thursday well-bid after having taken advantage of the slightly softer headline US CPI data last Friday. Our economists expect President Draghi to largely echo his Sintra speech, though we are preparing ourselves for some dovish commentary (or 'verbal acrobatics') designed to keep a lid on the EUR and German Bund yields.This might not be enough to dampen a healthy bull trend and we suspect the market narrative for EUR/USD this week will be "buy the Draghi dip". Watch out for 1.1270/85 as a key intra-week area. It seems as if markets are looking for any excuse to sell the US dollar and USD/JPY has pretty much echoed this sentiment. US politics and negative noise out of the White House is arguably starting to bite, but we're not entirely sure if Fed Chair Yellen said anything too different last week - or US inflation data was all that damaging to the overall economic outlook. Still, these were good enough reasons to keep a beleaguered USD on the back foot. The Bank of Japan (BoJ) meeting on Thursday is likely to be a non-event, but it'll be interesting to note the central bank's latest thoughts on its yield curve control (YCC) policy given the technical difficulties that stem from a rising global rates backdrop. After a slightly more upbeat labour market report, the UK data focus for GBP markets turns to CPI (Tue) and retail sales (Thu). Both headline and core inflation will likely remain at their elevated levels but this may be seen as slightly negative for BoE hawks given that it reinforces the real wages squeeze story. Indeed, a "not too hot" UK inflation print this week would support our view that a realistic BoE rate hike debate is more of a 2018 story. Retail sales may rebound this month after a dismal May print but the big picture remains of a slowdown in consumer activity. Hopes of a more conciliatory Brexit approach after the fallout from PM May's Great Repeal Bill may continue to provide support for GBP markets. We expect a busy local calendar to test the short-term bullish AUD momentum currently in place. The July RBA meeting minutes (Tue) should reiterate the central bank's status-quo neutral bias and longer-run concerns over domestic slack, while speeches by Board members - notably Deputy Governor Debelle (Fri) - will give an indication of how comfortable the RBA is with recent currency strength. Despite a slightly better 2Q China GDP release at the start of the week (6.9% vs. 6.8% consensus), AUD/USD has failed to push on much above the 0.78 handle; markets are likely to be wary of reading too much into this positive surprise, instead focusing on the slightly more bearish forward-looking outlook for iron ore demand. New Zealand 2Q CPI data (Tue) is likely to set the tone for the NZD this week. Markets have a good understanding that the RBNZ won't hike this year, with the overnight indexed swaps (OIS) curve largely focusing on a summer 2018 rate increase. While the consensus is for a mediocre 0.2% QoQ print, any concerning disinflationary signs could see short-term local rates drift lower. Elsewhere, dairy prices have remained resilient in recent months after recovering to mid-2014 levels and we suspect there'll be some focus on the GDT auction (Tue) given all the noise around falling global milk output. Upward price pressures in New Zeland's key export market will continue to add a layer of fundamental support to the NZD - making it one of our top picks within the commodity FX space. The BoC's post-hike lack of forward guidance - and lack of explicit efforts to control market expectations over future tightening - has seen CAD fall to fresh one-year lows against the USD and has kept the current hawkish market sentiment in place. Key macro data in the near-term will either justify or disprove the BoC's optimistic outlook; with 75bp of hikes priced in over a two-year period, the balance of risks are that data will disappoint CAD bulls. This story could play out as early as Friday; softer CPI and retail sales data may provide a bit of a reality check and could easily see USD/CAD correct back to the 1.27-1.28 area. EUR/CHF has sustained a break above 1.10, and we continue to question why foreign institutions are still holding CHF 47bn in CHF sight deposits. Beyond the regular sight deposit data, this week sees Switzerland release the June trade balance on Thursday, which is expected to remain healthy. USD/CHF could remain trapped in a 0.96-0.97 range, but the risks are that EUR/CHF might drag it higher. Having hidden behind the fig-leaf of low inflation for a while now, the Riksbank was left exposed when June CPIF came in unchanged at 1.9% YoY. Despite the currency-sensitive Riksbank's preference to lag the ECB in tightening policy, we think activity data will demand a re-assessment of the current dovish stance. Beyond the ECB event, the local focus will be the release of Riksbank minutes on Tuesday. The July meeting saw officials withdraw a rate cut from the profile and any tentative discussions of a hike could give SEK a lift. Similar to Sweden, June core inflation surprised on the upside in Norway. Combined with some stability in crude oil prices, EUR/NOK has made a decisive move lower. Technicals warn of a drop to the 9.30 area. The ECB meeting will drive EUR price action this week, but we suspect that EUR/NOK upside will prove limited. NOK is still relatively cheap in our books. The latest CFTC data continues to show net USD positioning hovering around multi-year lows. Most G10 currencies have a bullish/neutral short-term bias - with EUR, CAD and GBP seeing the biggest shift in sentiment over the past few weeks. It's not surprising given the recent hawkish rhetoric from local policymakers, although we think the risks of a positioning correction in these 3 currencies are high in the absence of any fundamental support.